Central Academy Sr. Sec. 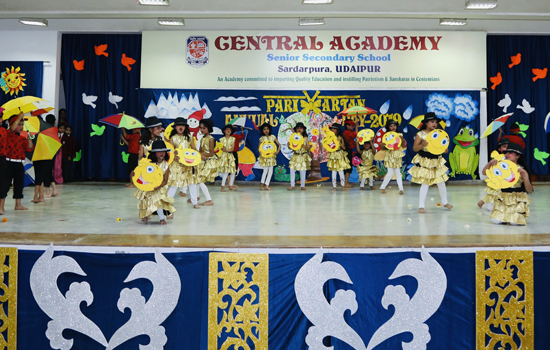 School, Sardarpura celebrated its Annual Function on 3rd February, 2019. The inaugural ceremony commenced with the lighting of the ceremonial lamp by the Guest of Honour Ms. Lakshyajaya Mishra, honourable director of the institution and Principal Ms.Priya Bose. The Chief Guest Col. Praveen Deo Commanding Officer, Girls Bn NCC, Udaipur & Special Guests Mrs. &Mr. Vilas Janve ,Former Programme Artist at WZCC were welcomed by Headmistress Ms. Supreet Saluja. The function was based on the theme Parivartan which was portrayed through dances and musical skits by the children of primary classes. The theme expressed that change is inevitable and is quintessential. Various forms of Parivartan were depicted ie Ritu Parivartan, Hriday Parivartan, Vyaktitva Parivartan, Prakriti Parivartan, Yug Parivartan. The dance based musical skit of Samrat Ashok, Megho ki Jhankar a dance on Varsha Ritu, Bharat ke Badhte Kadam- a patriotic dance and the compering done by children were much applauded by the audience. Mrs. Lakshyajaya Mishra appreciated the efforts made by staff and teachers and expressed that it is the intention of the management that each and every child should be given an opportunity to perform on stage, which is essential for the overall development of the children. All the children who participated in activities round the year were awarded and encouraged by the dignitaries."